Hello ! I get recommended from afsb dehradun on 19th may 2017. I m getting many requests to share my experience so i m posting it here. This was my 2nd attempt, in my 1st attempt on 6th march 2017 at afsb varanasi, i got conf. out. I was nt disappointed bcoz i knew i need to work on certain areas. First test is oir, u will hear from many persons dt this is nt imp. Bt as per my opinion oir matters for your screen in and as well as for overall selection later. The test is very simple,u can easily score above 95 out of 100 using basic aptitude and with a good pace. Then comes d ppdt on which ur screen in depends. The pic shown to u might be clear so dt u might see someone or it might be completely hazy. Jus make a positive and simple story dt what happened.. wht is happening and what is the positive wrk done by ur hero. Dont complicate ur story. At d tym of narration greet all candidates, have a good eye contact and shows confidence and narrate it loud enough. 80% work is done now. Now as i hav heard before my 1st ssb dt in group discussion it converts to fish market and becomes debate bt dont get panic. Doesnt matter how strong or weak ur group is, u will always get the chance to speak for atleast 2 times. In dt tym be clear..be louder and give valuable point. You will 100% get screen in. I hav seen d prsns in my group who scored good in oir. Narrated well, gd wd good and also narrated d common story bt still got out jus bcoz their story ws complicated..be simple. U cannot make a good script in 4 min. Understand this thing. Never look towarsds assesors. Screeing is all about these. Some thinks screening is luck, i dont agree at all. First is TAT-- Do the same thing as ppdt stories, be simple,time is always more than enough. Grasp d pic in 30 sec and write it legible enough to read. In every stories show some qualities of ur hero. WAT: dont jus write a sentence, it shoud reflect some qualities and writing should be like it should be legible. Dont leave anything. If u get stuck go to nxt one bt remember d left wrd and write d sentence later on wen u get tym,wen noone is around. Prepare for some common sample wrds earlier so dt u can write quality sentence. And for new words during test. Be quick to write some good sentence. SRT: One of the most imp. And easy test i wud say. The situations are simple. The best tip i would give is to complete all 60 . Bcoz if u r doing lesser, it means u r making an answer..u r nt writing d ist thing dt is comin in ur mind. And it is wrong. I did 60 both the tym and i never met a prsn till who has done above 54. Dont be slow or think much. Jus write it and it should be legible enogh. Dont think of writing beautifuly. Self description test: people take it very lightly bt it is the most imp. Test because whatever u have wrote earlier should match wid wt u r writing abt urself. Dont contradict. In interview also interviewer have a copy of self description. Dont fake or contradict. Both the times my psych. Went superb and this test matters alot bcoz one can get fit after training. Bt a persons intrinsic character, mentality cannot be molded. Show them wt u r and improve on how to express them. If u will be having d qualities psychologist Will never say no to u. INTERVIEW: 95% of the answers u know already, rest is about ur piq details, current affairs etc. Be calm and relax and confident. Body language matters most. Prepare for everything wt u hav written in piq. Dont contradict urself with ur piq or self description. And be upto date by current affairs. In my ist attempt i ws nt able to answer some questions related to gk. Bt this tym i nailed it. At d end i ws told by interviewer dt: aman ur academics are brilliant and u r even more qualified than me, and u r so humble and calm. 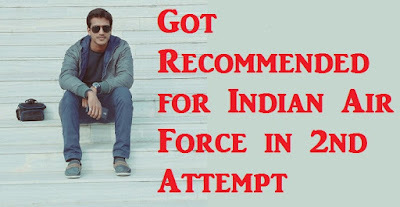 IAF would be happy to hav candidate like you. Bt in case u wont get selected.. dont loose ur heart bcoz u will make ur family proud one day. Conclusion is to show wt u are.. smile enough, be confident, answer tactfully. Interviewer will never say no about you. GD: just have the knowledge of current affairs, evergreen topics and be more knowledgeable. U will never get a topic about which u wont be able to say anything. Now the thing is i ws giving my points wenever i get chance.. bt seriously i spoke very less. I gave chance to others wen two were speaking at a tym. Bt wen u get d tym to speak..be confident and give valuable points. Do the same in both GD.. Then comes the gpe: make a logical plan.. write it fastly bcoz time is less.. give ur points and if u dont get much to speak..dont wry. and my group listened me and gto might also noticed dt. Dont be jus worker there. Or saying anything..ideas matter...dts it. HGT: think of the solution ist and tell to ur group and try to execute. U will get noticed. Dont just pic up d balli or rope and start doing. Lecturette: out of 4 topics one will be damn easy.. 2 avg. .And one above avg. Chose any quickly, better nt chose damn easy one and jus prepare a topic in a point manner. I chose d topic: alternate sources of energy. Damn easy topic ws ipl. Be confident, no need to greet gto. Look at everyone in their eyes. Be confident. 3 min. Will go so easily. And in other turns..listen dem wid attention. Command task: wtever u hav done will be assesed and accordingly gto will give u command task. If u r good candidate u wil be given tough one otherwise easy and medium. Wtever u get dont panic and do it brilliantly. GTO call candidate randomly and easy Command tasks are given in starting den d level is raised.. out of 9 i ws given d task in 2nd last. My task ws difficult and he raised the difficulty by saying bally is broken dt is broken etc. etc. Just use ur mind and focus on problem. And solve it. My ct went brilliant. And wen u r helper by other commanders..dont speak ever. Jus follow the orders, it may seem silly sometimes bt follow dem. Dont break rules. I ws called 6 times. After CT GTO will take his decision abt u..whether to select u or not. If u get medium CT..dont loose heart or panic do it brilliantly.. Individual obstacles: do it 5,10 or 15.. all matters is ur approch and technique..yes surely numbers matter and also for total ssb marks it will matter. Bt ur approach should be good. FGT is jus a formality.. u all will get a simple task.. bt still be active.. be helpful,give idea and complete it. 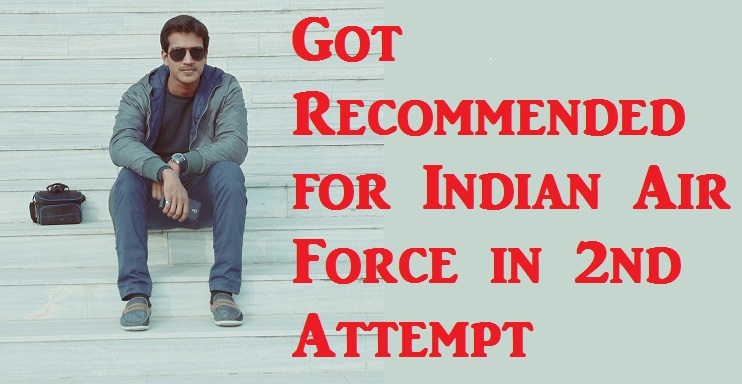 After my GTO i ws 100% confident of being recommended. At d tym of conference i ws asked why do u think u were nt selected earlier.. i said i ws week in gk last tym and some tests in gto. How u improve? Through newspaper and media. Are u satisfied dis tym? Yes sir, i did my best. Then at the tym of announcement? There were no pressure or tension coz i knew they will say chest no.58. As i did nothing wrong in 5 days. And i am recommended. I prepared through d friends,their experience and internet, i dont think coaching is needed. Bt still if u want to take..take it. Be prepared. And shows wt u are. I hav jus told u by words. You cannot prepare urself in 15 days or 2 3 months. Its who u r after 20- 25 years of age that matters. If u hav d qualities, no one can stop u. Some cleared it in 1st or 2nd attempt, some takes 20 but still get screened out. Improve urself day by day. After conf. Out in 1st attempt i didnt change anything in me..i jus find out the unanswered questions during interview..dts it. I ws doing masters during march to may.. i went exactly as i was in 1st attempt. The point is dont listen to rumors or dont manipulate urself. Bring positive changes. Be aware of negative people and focus on test.. enjoy the stay at ssb. U will get through. Still any question, feel free to ask. Better ask here only and not personally bcoz one might also have d same query. And getting recommendation is not enough,medicals are there.. merit list is there..and there are very less seats in ground duties. So score good in written and give best in ssb. So dt nt only u get recommend bt also get in merit list. All d best to all!